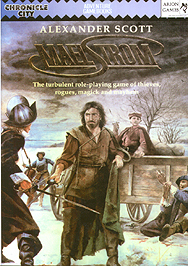 Enter the world of Maelstrom - the classic role-playing game! Imagine a band of Tudor travellers on the long road from St Albans to London - a dangerous journey in troubled times. Which will YOU be? You choose the characters, YOU decide the missions and YOU have the adventures in the turbulent world of Europe in the sixteenth century - either as a player or as the referee. Complete with Beginner's and Advanced Rules, Referee's Notes, maps, charts and a solo adventure to get you started, Maelstrom is a great game for two or more players.